There has been a great response across the South West to the call for people to go to London on the 17th June to lobby their MPs and ask them to make Climate Change a priority issue in this Parliament. The map currently shows that hundreds have registered in advance to say that they will be participating. 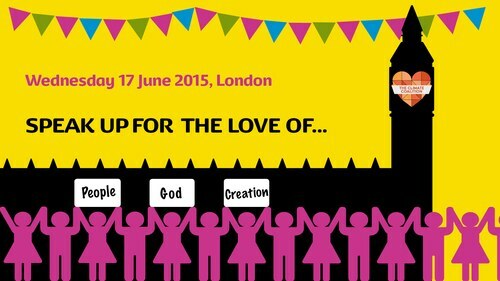 Christians from across the UK will join with a range of secular groups on the lobby. One of those travelling a significant distance is the Revd Dave Matthews, leader of a Fresh Expression church for surfers at Polzeath, North Cornwall. Bishop Nicholas will lead the ecumenical service, organised by Christian organisations involved in the Climate Coalition. It will be held at 12 noon at St Margaret’s, Parliament Square, where people will have the opportunity to pray and worship together, while hearing from Bishop Nicholas about the church’s mandate to speak up about climate change, and the devastating effects climate change is already having on the world’s most vulnerable people. Later in the day, thousands are expected to arrive in Westminster for the mass lobby, brought together by more than 100 agencies through The Climate Coalition. We will be there with our new EcoChurch Southwest banner and hope to see you in the Gold Zone where people from constituencies across our region will be gathering. 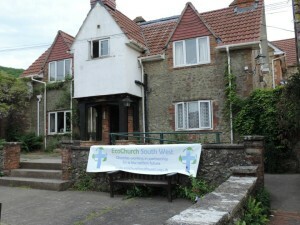 Hilfield Friary models the new Ecochurch Southwest banner. This entry was posted in Bath & Wells, Bristol, Dioceses, Exeter, Gloucester, News, Salisbury, Truro. Bookmark the permalink. Both comments and trackbacks are currently closed.